Miriam Carey, a 34-year-old dental hygienist, is allegedly the suspect who was killed after being chased by police in Washington D.C. today. Carey hasn’t been officially identified–police officials have said they aren’t giving any more information about the case tonight–but ABC confirmed with a family spokesperson that it was Carey. Carey was a resident of Stamford, Connecticut, possibly living at the Woodside Green apartment complex. FBI and other officials surrounded the area on Thursday night and were interviewing neighbors and searching her alleged residence. While authorities wouldn’t say whether Carey was armed, NBC reported that she wasn’t. The woman alleged to be Carey died after being shot by police officers, said Metropolitan Police Chief Cathy Lanier. Capitol police said that the situation appeared to be isolated and not linked to terrorism. The woman’s car at one point had been surrounded by police cars and she managed to escape, careening around a traffic circle and past the north side of the Capitol. Video shot by a TV camerman showed police pointing firearms at her car before she rammed a Secret Service vehicle and continued driving. Lanier said police shot and killed her a block northeast of the historic building. “This appears to be an isolated, singular matter, with, at this point, no nexus to terrorism,” said Capitol Police Chief Kim Dine. A 18-month-old girl was in Carey’s vehicle when she was killed, and was taken to an area hospital. 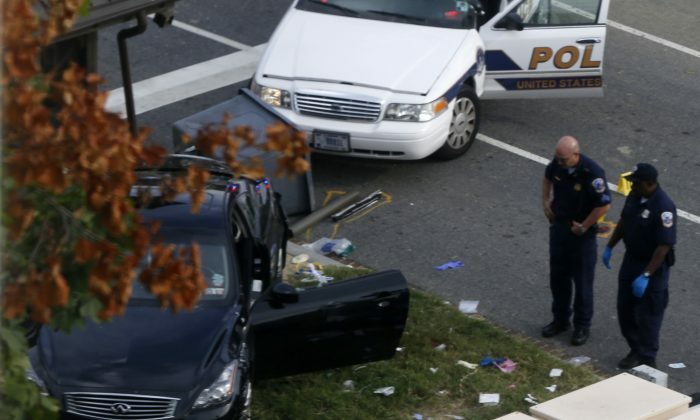 The motives behind the chase, which began after Carey tried to ram a barrier near the White House, are unclear, police say. A woman with the same name attended the City University of New York and is listed as a dental hygienist, according to a pamphlet from Sept. 2007. The pamphlet says that Carey graduated in 2007 and received a raise. Carey was welcomed to Advanced Periodontics in Hamden, CT in a newsletter several years ago. “We are excited to have Miriam! She not only brings a delightful bedside manner, but also has a degree in nutrition that we hope to utilize in educating our patients about how important there diet is to maintaining optimum oral health,” the newsletter says. Sources told the New York Post that Carey was licensed to practice in New York and Connecticut, and had a permit to work as a hygienist in Connecticut prisons. Carey appears to have worked for Advanced Periodontics for two years. Her former boss, Dr. Brian Evans, told the Daily News that Carey fell down some stairs and suffered a pretty significant head injury, during the two years she worked for him. Carey found out that she was pregnant while in the hospital and “seemed happy,” said Evans. According to Carey’s Facebook, she lives in Stamford and is from Brooklyn, New York.